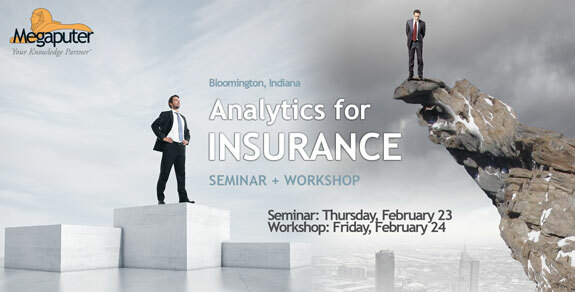 BLOOMINGTON, IN–(Marketwired – January 06, 2017) – Megaputer Intelligence announces the Analytics for Insurance seminar and workshop (www.polyanalyst.com/seminars/insurance-2017), with a special focus on Text Analytics, to be hosted on February 23-24, 2017 in Bloomington, IN. Participants will learn how to solve difficult tasks encountered in the health and property & casualty insurance domains through the use of advanced text analytics. Leading industry practitioners will present analytical solutions developed for addressing typical challenges in insurance, with topics including: analyzing customer and employee survey responses, predicting subrogation opportunities, detecting insurance fraud, and analyzing call center transcripts. The seminar will outline the steps and challenges one encounters when implementing a text analysis solution at an insurance company. Text analysis specialists will provide an overview of how to automatically extract information from external data sources, derive features and relationships of interest from documentation, and perform competitive intelligence through the analysis of social media. In addition, they will discuss theoretical foundations and practical system implementations for the analysis of BIG DATA. Speakers will present recent successful applications of advanced text analytics in the operations of industry-leading companies. The seminar will serve as a convenient setup for networking and sharing knowledge with thought leaders from other insurance companies. The seminar will be followed by a one-day, hands-on workshop arming attendees with practical skills for solving text analysis tasks efficiently and accurately. Participants will experience first-hand the benefits of PolyAnalyst™, Megaputer’s flagship data and text analysis tool, for performing deep linguistic analysis and obtaining highly accurate text analysis results. Megaputer Intelligence (www.megaputer.com) is a leading developer of data and text mining software and custom analytical solutions for various application domains. Megaputer analytical tools enable over 500 customers worldwide to make informed data-driven decisions.